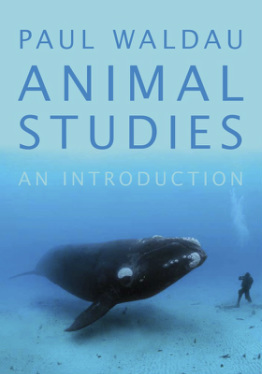 Animal Studies-An Introduction was published in 2013 by Oxford University Press. This interdisciplinary introduction to the emerging field of Animal Studies addresses multiple academic disciplines in order to foreground both the nonhuman animals themselves and the imagination-based and ethics-driven features of human life needed for us to consider our inevitable intersection with the living beings outside our own species. To present the full story of how the human species has in past treated our fellow animals, how we are now treating them, and what future possibilities are evident in this vital domain of human life, this volume examines the fields of education, history, law, politics, public policy, philosophy, religion, various creative arts, comparative studies, critical and cultural studies, and both social and natural sciences. Such breadth is necessary if humans are to provide a full unbiased account of the human-nonhuman story. Click on the following link to download an "Eblad" by Oxford University Press about this book which includes the Table of Contents and text that will give you a good idea of the book's style and approach to this important topic. More on the book appears below--it can be purchased in an inexpensive paperback version at Amazon.com, at the website of Oxford University Press, or at any Barnes and Noble bookstore. In this compelling volume in the What Everyone Needs to Know series, Paul Waldau expertly navigates the many heated debates surrounding the complex and controversial animal rights movement. Organized around a series of probing questions, this timely resource offers the most complete, even-handed survey of the animal rights movement available. The book covers the full spectrum of issues, beginning with a clear, highly instructive definition of animal rights. Waldau looks at the different concerns surrounding companion animals, research animals, work animals, and animals used for food, provides a no-nonsense assessment of the treatment of animals, and addresses the philosophical and legal arguments that form the basis of animal rights. Along the way, readers will gain insight into the history of animal protection--as well as the political and social realities facing animals today--and become familiar with a range of hot-button topics, from animal cognizance and autonomy, to attempts to balance animal cruelty versus utility. Chronicled here are the key figures and organizations responsible for moving the animal rights movement forward, as well as legislation and public policy that has been carried out in North America, Europe and Asia in the name of animal rights and animal protection. The final chapter of this indispensable volume looks ahead to the future of animal rights, and delivers an animal protection mandate for citizens, scientists, governments, and other stakeholders. With its multidisciplinary, non-ideological focus and all-inclusive coverage, Animal Rights represents the definitive survey of the animal rights movement--one that will engage every reader and student of animal rights, animal law, and environmental ethics. Published in 2006 by Columbia University Press and now available in a paperback version, this is the most complete volume in the new academic field of religion and animals. The book represents years of work following a groundbreaking conference at Harvard University in May of 1999. Paul is co-editor with Harvard Divinity School's Kimberley Patton, a highly respected scholar of comparative religion. Paul and Kimberley co-wrote the introduction. In addition, Paul has two pieces in the book - (1) "Seeing the Terrain We Walk - Features of the Contemporary Landscape of Religion and Animals" and (2) "Pushing Environmental Justice to a Natural Limit." The volume can be ordered at http://cup.columbia.edu/book/978-0-231-13642-6/a-communion-of-subjects. There is an excerpt from this book available by clicking above on the page "Publications for downloading." The Science and Well-being of Elephants in Captivity. The following is the explanatory "blurb" for this volume: There once were about 160 species of elephants, reaching back across 60 million years. Today, only three remain, and their survival is not certain. An Elephant In The Room: The Science and Well-Being of Elephants in Captivity, authored by experts from around the world and astride many disciplines, brings a new voice to assist their future. It examines the many and perplexing difficulties of elephants in captivity, looking for the best questions and trying to provide good answers. 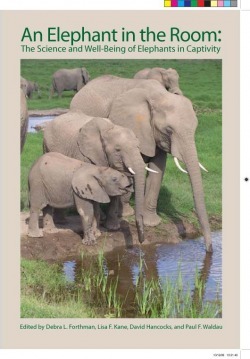 The book presents the biological, ecological, and social dimensions of elephant behavior in the wild as the basis for any sound understanding of what elephants want and need. It discusses the effects of trauma and stress upon elephants, with a close look at current captive management systems and beliefs. It also offers a scientific assessment of captive elephant welfare, and practical methods to improve fundamental aspects of the lives of elephants in captivity. Presentations of new and impressive initiatives in the form of orphanages and sanctuaries provide hope for the future, as do new visions that would transform the current management regimes in zoos. Humans have over millennia caused elephants enormous anguish, and even their imminent demise. Are we also capable of saving them? Is captivity a requirement for this, and if so, what should it be like? What are the special needs of elephants? What can be done to improve their quality of life? The number of zoos giving up their elephants has been growing in recent times. More are questioning whether zoos can provide for the extraordinary demands of these extraordinary beings. To help address this, the book concludes with a set of Best Practices: a synthesis of science and ethics to guide a healthier future for captive elephants. Anyone interested in animal welfare, and especially the welfare of elephants in captivity, will find this book essential and enlightening reading. Published in 2001 by Oxford University Press, this volume addresses (1) early Buddhist and Christian views of nonhuman animals, and (2) basic conceptual issues that arise at the multi-faced and multi-tiered intersections of human and nonhuman worlds. For an excerpt, click above on the page "Publications for downloading."